OZ BY THE SEA HAS LOVELY OCEAN VIEWS FROM THE LIVING ROOM & DECK! We call the house, Oz by the Sea. It’s beachside location and large decks make it perfect for dining al fresco. The view of the ocean and the sound of the surf from the deck and the Lanai, provide atmosphere and melody for entertaining. If there are any little pirates, stargazers or porpoise spotters among you, they can climb up to the crow’s nest at the top of the house, facing the gulf, and have a little adventure. Sunbathers will love this area too. The interior of our home has been nicely decorated, making you feel welcome, pampered and indulged. The living room is comfortable and cozy and even has a reading nook for the kids. This room is tastefully decorated and has a row of full length windows facing the deck and ocean, so the views are lovely! The master bedroom has a pillow-top king size bed, and a bathroom with an over-sized shower. There is also a screened-in porch off the master bedroom, facing the gulf…great for nodding off while reading that summer novel or even for a dreamy night in the right weather. Plenty of comfortable seating for a family. I love having my morning coffee here...not to mention my evening wine. The second bedroom has a full and a twin size bed. The third bedroom has a luxurious full sized bed. The kitchen is fully stocked (all cooking utensils, pots and pans plus Panini press and waffle maker) for the chef in the family with all modern appliances, Corian countertops and bar seating for six. All linens, paper towels and TP are provided. There are games and books for all ages. There is a flat screen TV and movies for the entire family—a great way to end a fun, sun-drenched day at the beach. I have also provided oversized, quality beach towels for your use as well as oodles of beach toys. There are beach chairs and a small cooler for you to take out to the beach. Oz by the Sea is on a quiet, dead-end road. The area is known as Palm Beach and is one of the oldest and most established on the island. Automobiles are not allowed on the beach here, so your family is safe to frolic in the waves and build sand castles without dodging vehicles. If you are a horse lover, there is a place a few minutes away for you to rent one and go for a ride on the beach! I think you’ll agree that all of this makes our beach home a wonderful place for your family to retreat to for their holiday in the sun. Plus, there are lovely restaurants nearby, golf, fishing, miniature golf, the seawall walkway, pedal carts that will carry a family of six, bicycle rentals, historic tours, sight-seeing boat rides, a historical air museum with classic plane rides available. Moody Gardens (with the Aquarium Pyramid®; Rainforest Pyramid®; Discovery Museum; IMAX® 3D, 4D and Ridefilm theaters; or the Colonel Paddlewheel Boat)Schlitterbahn Waterpark Resort and the historic Strand area for dining and shopping. Katherine VanDewater and Lance Osborne With 5 kids, 4 still at home to take care of, we lead exceptionally busy lives! What parents don't these days! So, when we need a little escape, to slow down and just enjoy our lives, we head to Oz by the Sea! We have wonderful neighbors there, amazing views and a clean, beautiful and QUIET beach. We chose the West End of Galveston Island because it was just far enough away from all the busy areas of SeaWall Blvd. yet close enough for us to go in for a nice dinner or lunch whenever I didn't feel like cooking! We also chose the West End for the quiet, private beaches and the family atmosphere of the area. Our beach is restricted from vehicles, so this also keeps the partying crowd away and thus makes our beach safe for children to wander and play on! My most important goal for my guests at our beach home is for them to feel 'at home!' I try very hard to provide all the little extras, like beach towels, beach chairs, beach toys, boogie boards, loads of pales and spades to dig with...you name it, we probably have it at Oz! As a parent I know what a pain in the neck it is to tow all those things along with you on your journey to the beach, so if I can make your trip here more comfortable as well, then I am pleased!! I want to make going away to Oz for the weekend as easy, carefree and relaxing as possible. Likewise, my kitchen is also filled with all you need to cook like the chef you are! 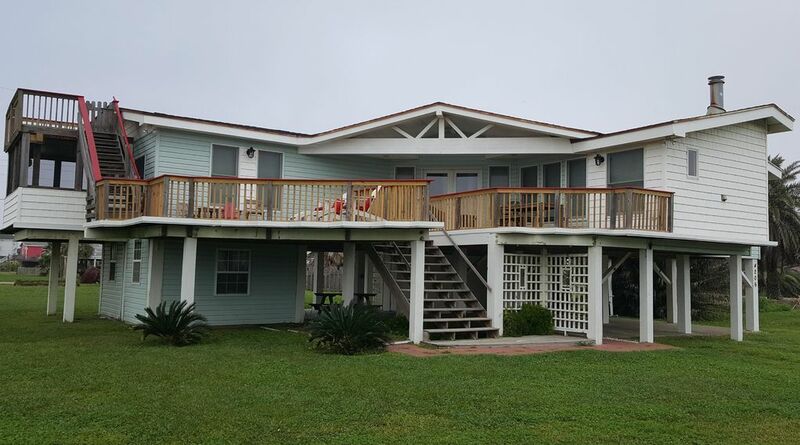 This is a great house with a fantastic deck to build some quality family time while taking in the scenery. Wow, what a difference a year makes. We've stayed at this house before and always loved it, but the work done recently to improve the deck and exterior--it's practically shiny now. The owner has always decorated the inside in such a cute, homey fashion. Now they've expanded some of the space so we had more room for all our big family's stuff. Love this house. Love Galveston's west end. My wife and I, along with our two-year old toddler, rented this beach house in early October 2015 for what was supposed to be a nice getaway. The pictures of the house were stunningly beautiful, and helped entice us to come here. What we actually saw, however, was completely different. We noticed the deck. This was one of the main reasons we chose this beach house, after seeing several beautiful pictures of the deck with children having fun on it. The deck is in serious need of repair, and should probably be redone completely. There were loose boards, and one or two with significant holes. Moreover, in some places the railing wasn't attached, so if our toddler wanted to she could pull them away and risk falling off. Lastly, the deck had not been cleaned at all, because otherwise we would not have found some old fish hooks lying about, that our toddler could have picked up if we weren't careful. The deck posed a serious risk to our child, so we refused to let her walk on it, and instead kept her inside. The last complaint I have was the mold that was visible in several spots along the ceiling of the beach house. The owner had said this was normal for beach houses in the area. Despite the several things that went wrong during our stay, I did give two stars instead of one, for the very reason that the owner was understanding enough to refund our cleaning fee, and gave an apology (both verbal and written) for the condition of the beach house. Lesson learned. From now on, we will make sure to inspect vacation rentals IN PERSON, before making a commitment to purchase a stay. Great news: We've invested thousands of dollars on upgrading the deck and entire exterior of this house (SEE RECENT PHOTOS.) We have also switched to a new cleaning service and brought in professionals to get rid of the typical beach house mildew challenges. We rented this house for a summer getaway for our family of 5. It was exactly as described! Stocked with everything you need for the beach, which was great! We didn't have to haul any sandy beach toys, gear, or even towels! The owners provided it all! The beach just is a short walk away and the house has great views. Highly recommend this property! We are so happy that you had everything you needed for adult and kids alike. Sounds like a rompin' good time by all! I am THRILLED you all had such a wonderful time at our home! Thank you for taking the time to review your stay, it is much appreciated. Making our home feel like 'your beach home' has always been my goal as a vacation rental owner. Working with lovely guests, such as you and your family is just icing on the cake of life! Cheers, and I look forward to your return! A great family beach vacation!! Perfect house for our family vacation. This was our first trip to Galveston, as both my husband & I are both from the east coast. It was an easy drive from Dallas, less than 4.5 hours, which was a nice change from flying, renting a car, etc. Our kids 4 & 7 LOVED the pirates crow's nest. The house provided everything we could have needed, beach chairs, sand toys, boogie boards, toys, games, books, etc. The walk to the beach took less than 5 minutes, and the kids never complained once. They even provided a cart to wheel everything there. We had the beach to ourselves most of the time. The owner was VERY helpful & accommodating, and always very quick to respond. The house was very clean & well maintained. The listing and photos were very accurate. Palm Beach is not the fanciest beach, but perfect for a quiet family vacation. One night we went to the new pleasure pier in Galveston & our kids had a BLAST riding the rides, which was about a 10-15 minute drive. We will definitely be back! We are honored by your kind words. Can't wait to see you back at Oz!